Manchester United legend Gary Neville has dropped a major hint over Mauricio Pochettino’s future at Tottenham amid links with the Red Devils. The former England defender has spoken before about what a big fan he is of the Argentine, who has also emerged as a leading target for Real Madrid after the sacking of Julen Lopetegui. However, with Jose Mourinho also struggling at Old Trafford and links with the likes of Zinedine Zidane and Antonio Conte not going anywhere, it could be that Pochettino is set to come in next at United. Neville seems to be suggesting so as he makes it clear he expects this is the beginning of the end for the Spurs boss in north London after a difficult season. 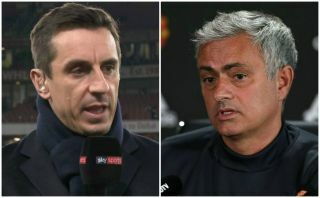 ‘He is a brilliant coach, but at some point he was always going to want to manage one of the super-clubs in Europe,’ Neville told Sky Sports. Who'd you want to replace Mourinho at Man Utd? ‘There are a couple at the moment that you can imagine will be changing manager in the next 12 months and looking at him, and he will know they are looking at him. Neville will be well aware one of the clubs he is referring to is United, with the Telegraph also claiming they’re on alert as he looks ever closer to a move away from Tottenham.